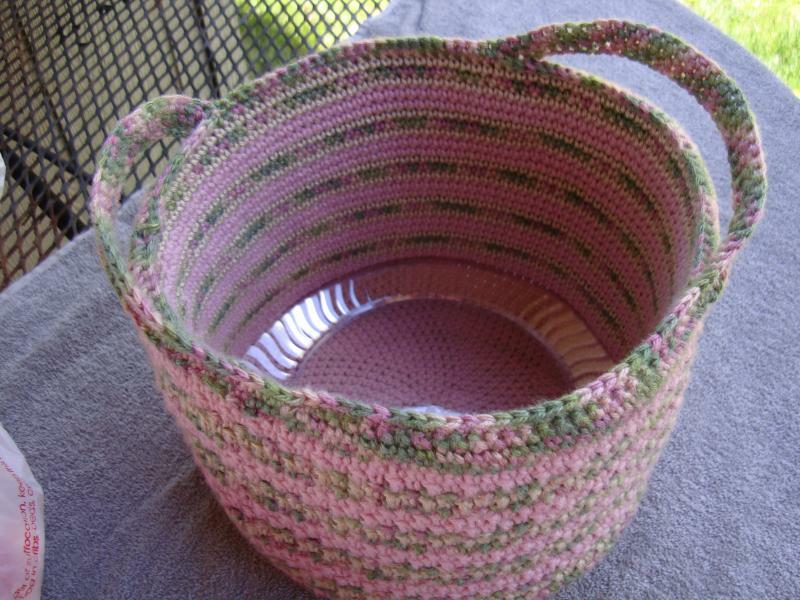 I really struggled with making a basket out of the leftover yarn from making my mom an afghan. Thank you to all who gave me excellent suggestions! I also made her a shawl. Together they are her Mother's Day present. 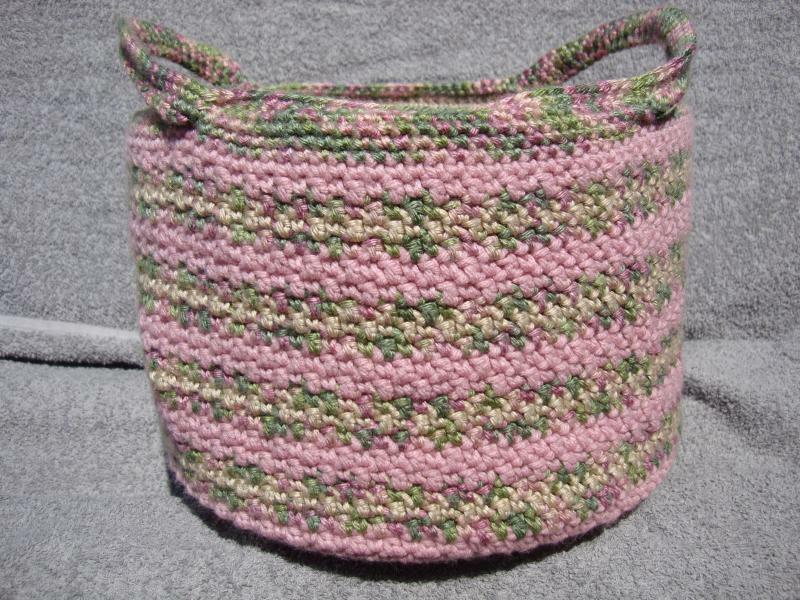 ETA: The basket was made using a pattern and knowledge learned from Marty Miller's "Mastering Foundation Stitches" at craftsy.com. That is so pretty and I love the colors. that is so pretty, any mom would love that! I love the basket! You did a wonderful job. Thank you all so much! It's wonderful to get such a boost after a lot of struggle, doubting and wanting to just give up on it. Absolutely beautiful. Fantastic job too. Wow, I love it!!!! And I'm sure your mom did too. Great colors! I have such a hard time with those patterns. Awesome job! mrsnjonesjr, there are a couple of tricks to making a spiral a flat circle and then having it curl up evenly. 1. The counting is what throws a lot of people off. I think of it in sections. How ever many stitches are in your first ring, that's how many sections you'll have. For spirals, I start with 6 sc in a ring, so I'll have 6 sections. Then for the flat section, I'll increase once per section on every round. So, the rounds are 6, 12, 18, 24, etc. It doesn't matter where you do the increase in each section, as long as it's the same place so that the increases are evenly spaced. When I get to round 3 and beyond, I count 123 (6 times). Then 1234 (6 times) and so on. When you want it to curl up, stop increasing. 2. The other thing that throws people off is knowing where the next round starts. I get a piece of waste yarn in an easy to see color (light, if my project yarn is dark or dark, if my project yarn is light.) On round two I lay the waste yarn under the first stitch, with the tail facing me. 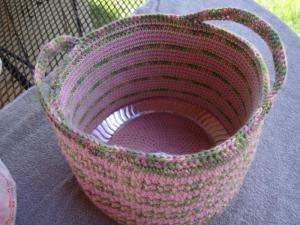 On each subsequent round, I flip the waste yarn back and forth always under the first stitch. This creates a running marker under stitch 1. When I'm done, I just pull it out. The other advantage is that it makes round counts easy. When the waste yarn is on the back, I'm on an even round and vice-versa. Thank you so much for taking the time to give me these tips! 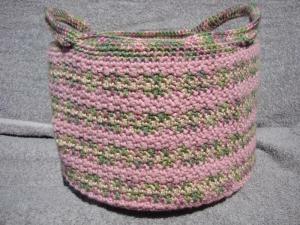 I may just make a basket my next project. YAY! If it comes out half as nice as yours I'll be happy. Location: at a shape-note singing! Very nice basket! The instructions you give are the ones I've used for making many flat round mats and bag bases. The marker yarn is a good trick too. I'm considering a bag or basket for plastic magnetic letters for the grandbaby - so we can store those things somewhere besides the front of my fridge!